On Wednesday 11 March, London South Bank University (LSBU) welcomed Tomos Toumazis MBE, from LadBible and Childline, to deliver an electrifying and inspirational talk as part of LSBU’s annual careers evening organised by the School of Business. 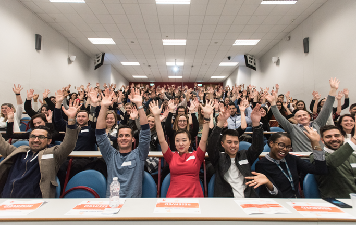 A range of prestigious industry experts volunteered to speak to our students during the event, including senior managers representing well-known multi-national brands such as Coca-Cola, Amazon and the Institute of Public Policy Research (IPPR). During the day, students had the opportunity to attend workshops on how to network effectively, how to achieve the perfect interview and a recruiter’s approach to writing CVs. Meanwhile students benefited from daytime workshops focusing on how to get your first job and prepare for applications post-university. The evening keynote address focused on skills required to consolidate a successful career. Why does the School of Business organise this annual event? The aim of the annual careers evening is to inspire and develop the self-confidence of our students by showcasing industry speakers as well as inviting alumni to network and speak to our current student body. Mel Godfrey, Head of Business Partnerships and Employment Outcomes in the School of Business, is responsible for organising this popular annual event. Over the years, Mel has developed extremely strong and close external relationships with business for the benefit of our students. She continues to go above and beyond her brief, demonstrating that she truly cares about the future of our students. The event was a huge success with over 400 students in attendance throughout the day. Over 70 alumni returned to LSBU to network with current students, catch-up with friends and see old lecturers who they constantly say they owe so much to. Alumni represented organisations like Barclays, EY and Mediacom. The success of many of LSBU’s alumni demonstrates the added value of the skills education that our students receive, combined with the confidence needed to succeed in whatever industry they choose to pursue. How can you help London South Bank University? The University is constantly looking to develop relationships with alumni and organisations who are looking to ‘give-back’ to our students. ‘Give back’ is a catch-phrase that has been coined primarily due to the University’s award-winning nature. The phrase demonstrates that the reasons for supporting LSBU and its students usually isn’t just financially motivated. Alumni and external organisations can provide LSBU with support in a number of ways, from offering to mentor our students, be a guest-speaker at lectures, provide work placements and internship opportunities and act as a live case study ensuring that our students receive hands-on practical education. "Great Advice from Paul Grace, Sales Director of Coca-Cola at our annual LSBU Employability conference and careers. Be a-bit more crab - Do not be afraid to go sideways. Build a strong team around you that have the capabilities you may not possess. A sincere thank you to all who attended and spoke on the evening, whether you were an alumni, member of staff, or a friend of LSBU, we hope to continue developing our relationship.